Cited as a model of what a servant-leader should be, Birmingham banking executive O. B. Grayson Hall Jr. received Samford University’s 2016 Mann Medal in Ethics and Leadership Thursday, Feb. 25. Hall, chairman, president and chief executive officer of Regions Financial Corporation, received the award at a breakfast event cosponsored by the Frances Marlin Mann Center for Ethics and Leadership and the Samford Network. The honor is presented by the Mann Center to leaders or organizations whose efforts have made significant contributions to a more just and ethical society. Hall, noted Samford Vice President for University Advancement Randy Pittman, has instilled in his Regions employees an attitude that serving the customer is not just a job, but a calling. “Grayson has always encouraged his team to do the right thing. 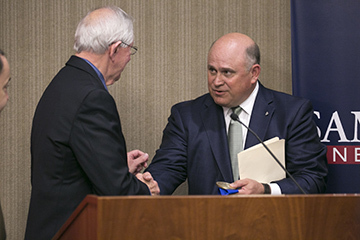 This is the very definition of integrity in business, and I know of no better role model of integrity than Grayson Hall,” said Pittman, noting that the honoree’s integrity stems from a fundamental Christian faith that has instructed him throughout his life. Hall, who began his career with Regions in 1980, was named president and chief executive officer of Regions in 2010 and assumed his current role in 2013. Regions is a top U.S. bank-holding company headquartered in Birmingham with $126 billion in assets. Regions was recently ranked as the most reputable bank in the U.S. in an annual Reputation Institute survey. Pittman noted that Hall took over Regions during the height of a particularly bad national financial crisis that found his company in a “perfect storm” of unprecedented troubles. “He took on the challenge by keeping a steady, disciplined hand on the operations of the company, always encouraging his teammates to keep their focus on serving the customer,” Pittman said. Hall’s leadership has resulted in a reported net income in excess of $1 billion in each of the last four years, improved capital ratios and customer deposits at an all-time high at Regions, he said. Pittman also noted that Hall, who grew up on a potato farm in Fort Payne, Alabama, is as at ease with bank tellers, office assistants and maintenance staff as he is with corporate CEOs and multimillion dollar customers. Hall responded that the honor belongs to the Regions team, which includes 23,000 associates across 16 states and in 1,700 offices. “Every day, they serve our customers and our communities, and they serve them according to our core values, our vision and mission. It is a privilege and blessing to receive this honor on behalf of the Regions team,” said Hall, who was presented the medal by Samford President Andrew Westmoreland and Marvin L. Mann, a Samford graduate who established the Mann Center in 2008 to honor his wife of 53 years, the late Frances Marlin Mann. Hall said that the common sense expression “do what is right” in reality isn’t all that common anymore. “It takes courage, personal sacrifice and passion. Doing what is right in business has to be built on a platform of transparency and moral integrity,” Hall said. The financial crisis of 2008, he said, showed what can happen when there is a lost focus on doing what is right and building strong communities. Hall told how, in 2010, Regions embraced a concept of “creating shared value” as a foundation of its strategic planning process. The concept, he said, is basically built around integrity and doing what is right, and can also involve teamwork, accountability and performance. “We tried to make the concept sound new and exciting, but the truth is that we were just reintroducing the basics of old-fashioned banking business that focused on building value for customers, communities, associates and shareholders,” he said. “Put simply, the right values drive the right behaviors, which create the right results,” said Hall, who holds a bachelor’s degree from the University of the South and a master’s degree in business administration from the University of Alabama. He also attended Stonier Graduate School of Banking and executive development programs at Harvard Business School. Hall is the fourth recipient of the Mann award. Previous winners of the ethics and leadership award or its predecessor ethics in business award are former IBM and Lexmark executive Marvin L. Mann in 2006, Chick-fil-A founder Truett Cathy in 2008, and Prison Fellowship founder and penal system reform advocate Charles Colson in 2011. The work recognized with the award must address a clear need or problem facing society, have significance on a large scale, and be an inspiring example for others to follow. Pittman announced that prior to the event, both houses of the Alabama legislature had passed a resolution commending Hall on his selection for the Mann medal. The resolution was signed by Alabama Governor Robert Bentley.